Flusser client and friend Will Burghes works in Data & Analytics at Forsman & Bodenfors and lives with his wife Whitney and their dog Shadow in Park Slope, Brooklyn. 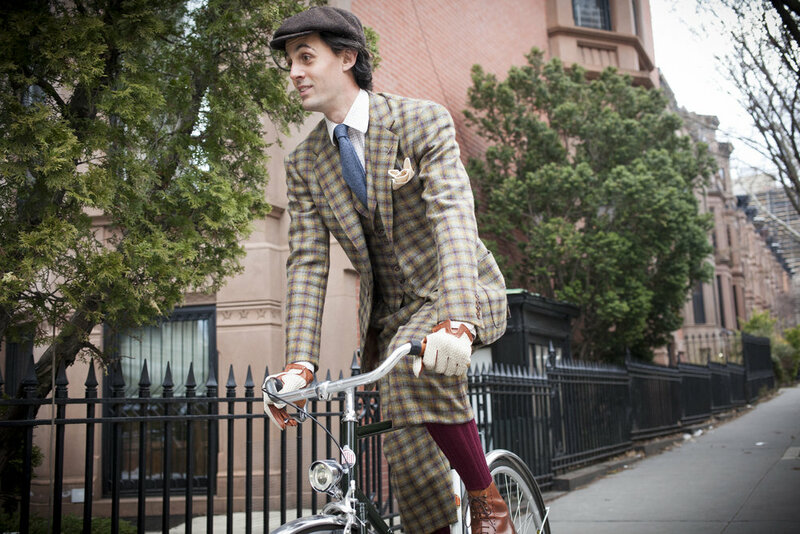 The story of the unique Dashing Tweeds cycling suit we made for him earlier this year can be found here. Describe your sartorial aesthetic. What has influenced and inspired it? How has it changed over the years? I gravitate towards simple, relatively large patterns and colours, and a wide array of fabrics. Being tall I can get away with wearing a lot of checks and I try to make the most of that. At this point I know what I like and what I don't. Some rules my father taught me are among the only ones I follow strictly. I do enjoy seeing how other people dress and getting ideas (or learning something to avoid!) from them. My maternal grandparents were a regular presence in my childhood and many photos of them still live on the walls of our home. My grandfather was a soldier in his youth and as my interest in clothes grew, his sense of style, both in uniform and in civilian dress, became a source of inspiration for me. He came from a generation more comfortable in tailored clothing than my own, but nevertheless had a clear sense of fabric, fit, pattern and texture that surpassed his peers (though he was undoubtedly aided by the beautiful wife by his side and his own chiseled good looks!). Looking at old photos of him, I am still shocked by the ease with which he wears his garments and the level of comfort he clearly had despite what would be considered a high level of formality today. 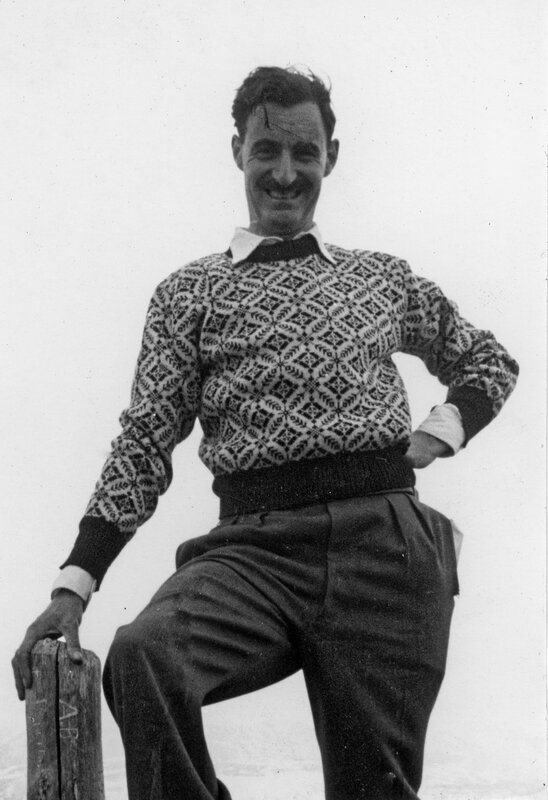 Outfits that would be almost inconceivable nowadays (grey flannels for a hike in the countryside, chunky knits on the beach) look obvious on him, as if any other option would have been nonsensical. In that spirit, I dress more formally now than I ever used to, I think because I've figured out how to wear tailored clothing and be comfortable, as well as how to look (relatively) decent doing so. Will’s maternal grandfather Ronnie Burghes, displaying impressive (and authentic!) sprezzatura. As an Englishman, is there anything you think American get wrong in their adoption of Anglophile dress? What do you find most uniquely appealing about American style? There are plenty of elements of American style I have not adopted since moving here: button-down collars, pockets on dress shirts, loafers with suits, striped ties. But I appreciate the historic ability of American dress to ride the line between formality and informality better than a very stiff British look. What was the reason you initially came to Alan Flusser Custom? Because Andrew Yamato works there! Also, of course, because Alan is a mainstay of New York tailoring and I knew that his advice would be better than I could get at any other house in the city. A bigger operation would have been more swayed by current trends and I did not want that. Do you feel it's important to wear custom tailored clothing in your professional context? What do you think it conveys? I appreciate Patrick Grant's assertion that dress is about having “respect for the occasion.” Your work should be enjoyable, but it's important that you treat that work as serious and take pride in it — dressing “seriously” is an important signal that you are serious about what you do. I got married in a morning coat for the same reason - what could highlight the importance of that event to me more than wearing an outfit that I will only have occasion to wear a handful of times in my life? 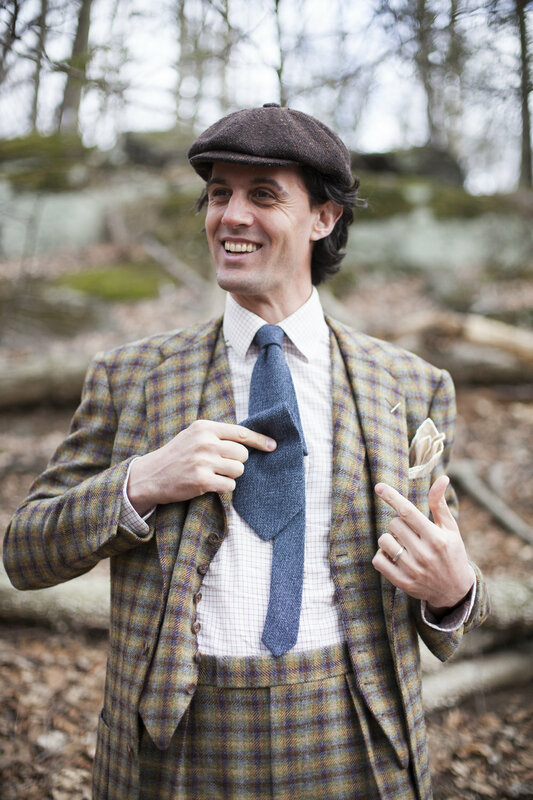 A navy flannel suit would not have been nearly unique enough. Describe your day-to-day attire during the work week and at home on nights and weekends. Mostly jackets and odd trousers with open necked shirts for both (though a suit and tie for client meetings is common). I don't alter my wardrobe much from week to weekend and sometimes dress more formally at weekends than during the week since I work in a very casual environment. What do you enjoy most about dressing? The history of the garments. I like that each element has a background story to it (even if it may not be true). Covert coats and their poachers pockets, for instance, or waistcoats and their pointless bottom buttons. Also the feel of a well loved and worn garment or pair of shoes. Something I've owned for a while that fits and has developed a patina over time as a result of me wearing it. A well-aged pair of brogues with ten years of patina and a beautiful shine on them are a thing to celebrate. So's a coat that's been repaired ten times over the years but still fits like a glove. How do you feel your clothes express your personality? Badly? I'm not a very extroverted person, but I tend to gravitate towards more colourful clothes than most men I know (might be me embracing my eccentric British side). I am proud to have never won the "best dressed" award at an office holiday party. How do you generally go about assembling a day's ensemble? What variables do you consider? I generally start with one thing that I haven't worn in a while and want to, that's appropriate for the day's weather - could be a pair of shoes, a suit or a jacket. Then I'll work around that, adding whatever will look good with it until I'm done. Obviously whatever work or the evening have in store for me that day plays a role too. Keep trying new things and don't be afraid of dressing badly now and then — it's how you learn. Figure out what you like and what suits you in terms of cloth, fit, style etc. It's a journey and no-one gets it right immediately, so just enjoy it. Find a good alterations tailor that you trust - wear clothes for a while and figure out what you like and don't about them, then get them changed. In extreme circumstances, don't be afraid to donate clothes to a thrift store or give them to friends and just try again! Read some of the classic books about style and learn why there are rules, not just what they are. Alan told me once that the point of having pleats on trousers was to allow them to fill the space in the jacket's skirt, and the point of there being two is that the outer pleat keeps the inner one closed. Knowing that is vastly more useful than just knowing that as a rule you should have pleated trousers. How do you define and/or walk the line between classic/traditional elegance and retro costume? I typically fall back on a couple of principles: 1) there is a right way of doing things that is independent of fashions and eras; a flattering silhouette is timeless and can be achieved without looking out of place in the modern day, and 2) in general, extremes should be avoided: overly wide or narrow lapels, too baggy or too tight garments, etc. Following those two broad principles has generally served me well. 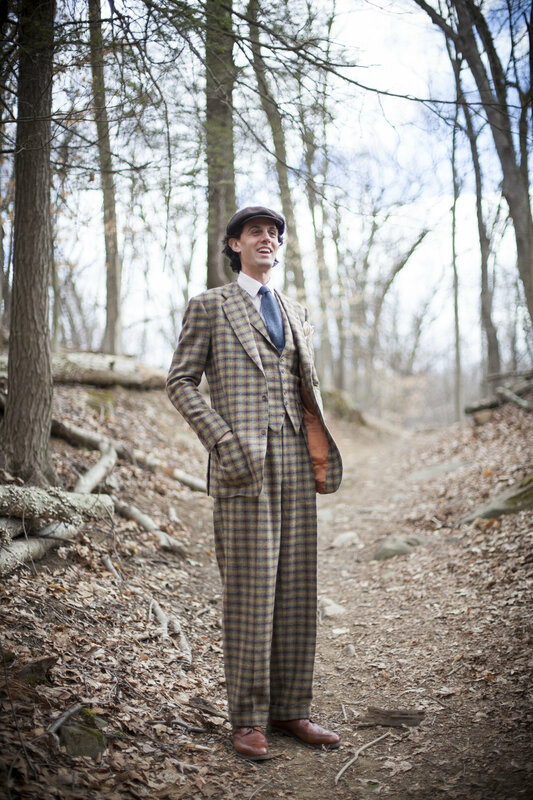 What inspired your unusual choice of cloth and cut for your first Flusser suit? On what sort of occasions do you wear it? I've long admired Guy Hills and his innovative work with cloth at Dashing Tweeds. How many other manufacturers can you name that have emerged this century? There aren't many. I wanted to support what he's doing while ordering something that would be impossible to find RTW. It's a lovely breathable cloth that's surprisingly good in both cold and mild weather. Great for walks as well as cycling.